Just when you thought inter-Korean relations couldn’t get any worse, they do. The North has found a fresh weapon, and on June 1, 2011 launched a sneak attack on the South—with a follow-up ambush a week later. Fortunately, we’re not talking ships sunk or islands shelled like last year. But words can do damage too, and this was a low blow. Despite poor inter-Korean relations in the three years since Lee Myung Bak became South Korea’s president, there have been regular rumors of secret North-South talks behind the scenes. Pyongyang recently confirmed these rumors, revealing the details of these talks and destroying any basis for future trust. The North’s broadsides can be read in full at http://www.kcna.co.jp/item/2011/201106/news01/20110601-29ee.html and http://www.kcna.co.jp/item/2011/201106/news09/20110609-35ee.html. It’s embarrassing hot stuff, and of course Pyongyang’s word can hardly be taken as gospel—though they do threaten to publish transcripts of the taped conversations. (Seoul says it didn’t know the meetings were being recorded.) The way the North tells it, the South had “begged” since April to have a secret meeting, which then took place in Beijing from May 9. The idea was two-fold: 1) to finally get past last year’s Cheonan and Yeonpyeong incidents; and 2) to hold a three-stage summit—first at Panmunjom on the border in June, followed by Pyongyang in August, with the final act in Seoul in March 2012 when the ROK will host the world’s second Nuclear Security Summit (NSS), just one month before parliamentary elections (now there’s a coincidence). For a leader whose shtick is that he’s a practical no-nonsense business type, Lee Myung Bak’s whole North Korea policy is straight out of fairyland—and this takes the cake. Who in their wildest dreams could ever imagine Kim Jong Il venturing to Seoul, of all places (by train? ), when he has steadfastly refused to do so even when friendlier folks like Kim Dae Jung and Roh Moo Hyun occupied the Blue House, to deliver an abject U-turn on the North’s nuclear policy to a lame-duck ROK president in his final months in office? And all this while the North is busy gearing up for its own fairyland (or emperor’s new clothes) moment: the centenary of its founder Kim Il Sung in April 2012, when the DPRK is due to proclaim itself a “great and prosperous nation”—even while its economy is broken and many of its citizens go hungry. Small wonder that there are calls in Seoul to sack the security troika—named by the North’s National Defense Commission (NDC) as Kim Chun Sig of the Ministry of Unification’s (MOU) Policy Office; Hong Chang Hwa, a director of the National Intelligence Service (NIS); and Kim Tae Hyo, President Lee’s security advisor—involved in this farrago. Worse yet, the North also claimed that the South offered “enveloped money”: a quaint name for a trait alas not rare in Seoul, nor indeed in inter-Korean relations. Pyongyang is being a rank hypocrite: In the past it had no qualms about trousering such well-stuffed envelopes, but this time the NDC scorned the South’s explanation that it was just offering to pay the North’s expenses. What rich irony for a regime as secretive as the DPRK to suddenly posture as a champion of openness: a virtue in any case much overrated. As with the Wikileaks, there is both prurient and genuine interest in becoming privy to what we weren’t meant to know. But although the Iraq imbroglio has made many in the US and UK rightly mistrustful of our mendacious leaders, it would be wrong to generalize such revulsion into a blanket call for always-open diplomacy. On the contrary. Sometimes you do need secrecy, as well as absolute assurance that the other guy—by definition, in these situations, someone you’ve no cause to trust (and vice versa)—won’t betray you. Classic cases-in-point are Henry Kissinger’s first foray to China exactly 40 years ago in July 1971, and the hush-hush Israel-PLO dialogue in Oslo during 1992-93. But Korea itself has plenty of examples of secret talks over the past four decades. It’s worth taking a minute to recall these—many remain little-known—and how much they achieved. Here, as always, Don Oberdorfer’s book The Two Koreas is a fascinating guide through this labyrinth. It all started with Kissinger’s visit to China, which alarmed Park Chung Hee and Kim Il Sung alike. That prompted the two Koreas to start Red Cross talks at Panmunjom in August 1971, but these got bogged down in reiterating entrenched positions. So in March 1972 one ROK Red Cross delegate, Chong Hong Jin—really he worked for the KCIA—quietly slipped out the door on the other side, and was driven to Kaesong and then helicoptered to Pyongyang. Within a month, the KCIA had a direct phone line to the North’s ruling Workers’ Party (WPK). It was swiftly agreed to upgrade the contact level. In early May, KCIA director Lee Hu Rak secretly popped across at Panmunjom. A man who terrified and terrorized many, Lee confessed to feeling “indescribable anxiety.” He was shown the sights of Pyongyang and then, during his second night, he was woken, bundled into a car, and not told where he was going. He feared the worst, but after midnight, finally came face-to-face with an affable Kim Il Sung. What did they talk about? Nationalism, of course. Oberdorfer has fascinating excerpts. 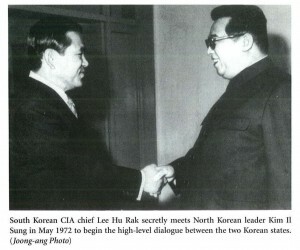 Lee assured Kim that Park Chung Hee “detests foreign interference most” and boasted: “In the future the big powers will yield to us [meaning a united Korea].” Kim even apologized for the 1968 commando raid which tried to kill Park—they got within a mile of the Blue House—claiming not to have known about it. Yeah right, but that’s how you get past obstacles and move on. Just as his son Kim Jong Il would assure Japanese premier Junichiro Koizumi 30 years later in 2002 that he hadn’t known about DPRK abductions of young Japanese. It may stick in the craw, but diplomacy does need face-saving formulae (i.e. lies) as well as secrecy. In autumn 1972, Red Cross delegations visited each others’ capitals for the first time. Sadly the bonhomie didn’t last, though this is not the place for a full chronicle (read Oberdorfer). The point is, even to get this far required secret talks too—and it was vital that they stayed secret. Fast forward over a decade. Park Chung Hee is dead, shot by the head of his KCIA (Lee’s successor), and another general has seized power in Seoul. Chun Doo Hwan will forever be rightly excoriated as the butcher of Kwangju in May 1980.Yet his diplomacy showed more subtlety. In September 1984, less than a year after KPA commandos nearly blew him up in Rangoon, killing 17 elite South Koreans and four Burmese, Pyongyang offered aid after floods in the South. Presumably, it expected Seoul to refuse. Chun, imaginatively, said yes. Thus, we had the amazing sight of hundreds of Northern trucks rolling across the DMZ in peace. The cargo revealed much about the North’s economy: wormy rice, feeble cement, and dodgy drugs (which the South quietly warehoused). But it was the gesture that counted. This ushered in a year of wider contacts, including the first ever family reunions, talks between lawmakers, five economic meetings, and more. It didn’t last, but it was a real breakthrough at the time. All of that was public, but once again, this was accompanied by secret talks behind the scenes. Remember Park Chul Un? A bright young Blue House aide, only 42 in 1985, Park blazed an extraordinary covert trail not only with Pyongyang, but later in Seoul’s wider Nordpolitik. What followed is especially interesting and very relevant now. Like Lee Myung Bak, Chun Doo Hwan wanted an inter-Korean summit. 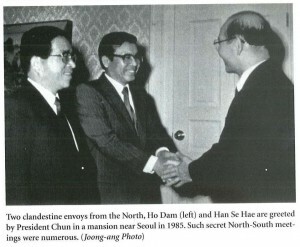 To that end, former DPRK foreign minister Ho Dam—with Han Si Hae in tow—secretly visited Seoul and met Chun in September 1985. I recall that visit being rumored at the time, so the secrecy wasn’t watertight. But everyone thought it was a hopeful sign, so nobody made political capital of it or spilled the beans. Of course, Chun was a dictator who had the press strictly under control, which made it easier. Among much else, Ho Dam insisted that the Rangoon bomb “had nothing to do with us.” If Seoul had demanded an apology there would have be no more talks. Chun seems to have let that go, which was big of him. Lee could learn a lesson from this. The recent NDC revelations do suggest that the South was trying to find a way past the Cheonan and Yeonpyeong incidents. A major irritant was the Team Spirit joint US-ROK war games, bigger each year and which Chun refused to cancel. Kim Il Sung once told the East German leader, Erich Honecker, that mobilizing reserve forces to counter these exercises cost the DPRK six weeks of GNP in lost labor time. Whether Kim genuinely feared an invasion or was just spooked and angry, at all events in January 1986 the North denounced this “nuclear war maneuver” and broke off all dialogue. All public talks, that is. But Park Chul Un and Han Si Hae’s contacts continued, even after Chun Doo Hwan conceded democracy and the people elected his fellow ex-general Roh Tae Woo (because the two leading democrats, Kim Yong Sam and Kim Dae Jung, ran separately). It did Park no harm that he was a nephew of Roh’s wife. Under Roh, Park served as sports minister and was even seen as a potential successor—though he also made enemies: read on. Widely reviled as mul (water; Margaret Thatcher used “wet” as a similar term of abuse), Roh deserved better. History will respect him as Korea’s Gorbachev, another man much traduced. Such rare leaders—South Africa’s F.W. de Klerk is another—who were both bold and skilled enough to see that the old order had to go, and who successfully and peacefully transformed a failing or noxious political system into a better one, surely deserve our praise, not blame. 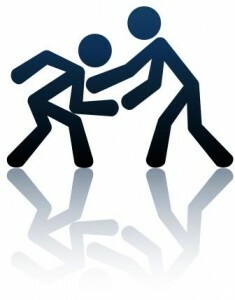 But Korea, like everywhere, is full of stubborn fools who see constancy, at all costs, as a virtue. Park Chul Un’s six-year role as a secret conduit to the North eventually helped lead to a third round of inter-Korean dialogue: 1990-92’s eight mutual visits of prime ministers, including the epochal (if unfulfilled) general and nuclear North-South agreements of December 1991. By then, Park had other fish to fry too. He was also Seoul’s point man on what was to prove the surer bet of Roh’s wider Nordpolitik. North Korea might blow hot and cold to this day, but communist regimes elsewhere—themselves moribund, but who knew?—were by this time, ready to face world and peninsular realities, especially if offered financial inducements. By now, a master of secret diplomacy, Park Chul Un was the obvious man for the job. The rest is history. For Park Chul Un things went less well. The flair he showed in diplomacy deserted him on home turf. He made the error of strongly opposing Kim Young Sam, when the latter changed sides in a blatant and successful bid to succeed Roh Tae Woo as president in 1992. Kim was not the forgiving sort; few in Seoul are. Park was indicted for receiving a bribe from a businessman who sold slot machines and spent 16 months in jail. That’s a pity, because Park had skills that Seoul still sorely needs. I could go on, and secret diplomacy did; especially in the sunshine decade (1998-2007), which is a whole other story. For present purposes, suffice it to have shown that Lee Myung Bak is by no means the first right-wing South Korean president to have had trouble with North Korea. Yet in their different ways, Park Chung Hee, Chun Doo Hwan, and Roh Tae Woo were all ready to take more risks and to be more flexible in pursuing North-South dialogue. Compared to any of them, Lee’s rigid approach to the North appears both fatally flawed in theory—with its totally unrealistic insistence on denuclearization as a first step—and amateurishly bungling in practice. Even so, shame on North Korea for stooping so low as to spill the beans on secret talks. That was a stupid as well as nasty move. Eighteen months from now, Lee’s successor—whoever that may be—will surely put out fresh feelers to the North. That will involve secret talks; it always does. But after this, how can any leader in Seoul trust a perpetually perfidious Pyongyang? The answer is: You have to keep trying. And if existing policy fails, try something different. Deplorable though the North’s latest conduct is, it might just jolt the Lee administration into a belated realization that its approach hitherto simply hasn’t worked. Lame duck or not, Lee still has a year and a half left in office. Influential voices in the ruling Grand National Party (GNP), which fears a hammering at parliamentary elections (just 10 months away) if things don’t look up, are already calling for a new approach to North Korea. Lee is not exactly known for listening, but with so much at stake and time running out, he just might give it a try.